Educational leaders guide to reflection and mentoring with teams! EDUCATIONAL LEADERS -Struggling to find the time and will to meet formally with all team members? Feel like the ‘bad guy’? ‘ Want to foster a more collaborative and inspired approach? Need the tools and templates to guide you step by step through the process though? 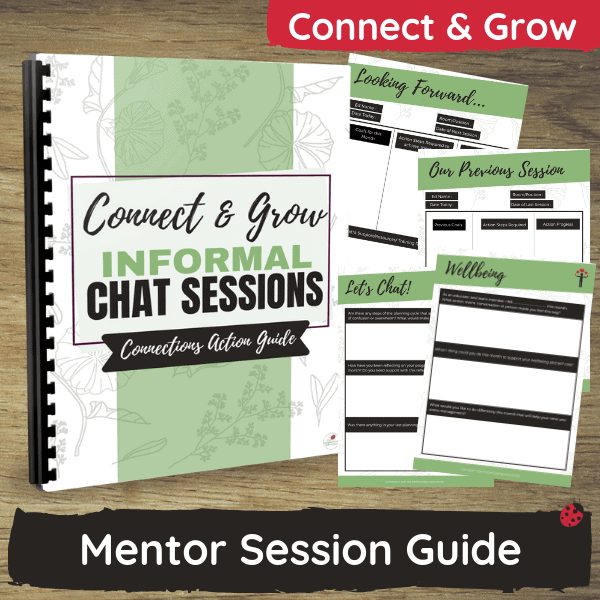 Connect & Grow Sessions are the answer! 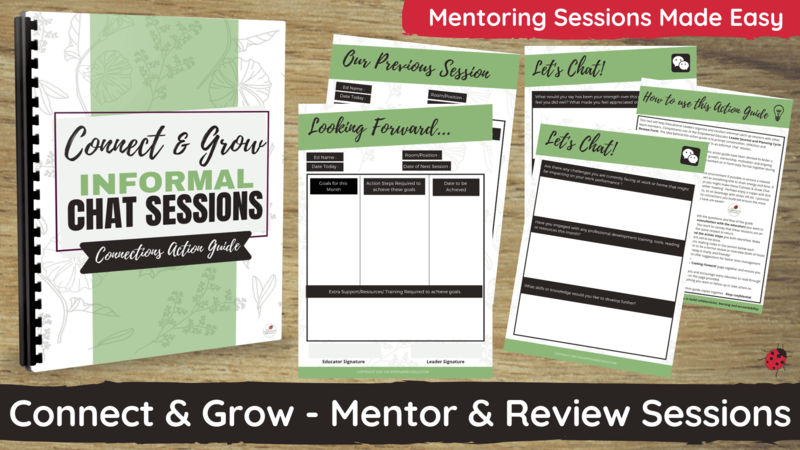 This guide gives Educational Leaders the prompts, templates and reflection questions to help them organise and conduct productive yet informal reflection and mentoring sessions with other team members. Easy to follow with printable templates. HOW CAN I USE THIS GUIDE TO MENTOR & SUPPORT EDUCATORS? discussion as you work through the guide together in an informal ‘chat’ session first rather than an intimidating formal meeting. Reflect on current practice in a supportive and friendly 1:1 space. Record progress on individual action plans and collaborate to assign new tasks and goals. Simplify frameworks, outcomes and principles and identify the areas that need some extra support. Share and inspire with programming ideas and inspiration. Identify any areas of concern or work performance issues for further investigation and problem-solving. Record evidence of ongoing support and commitment to team wellbeing and professional development. 12 pages in PDF format with editable text boxes so you can either choose to print and add to a folder to take on the go with you to the sessions or keep on the computer and type, printing only when necessary instead. 2. 3 pages of ‘Let’s Chat’ questions and conversation starters to prompt reflection and feedback.